MARCH 14 was a momentous day for wildlife conservation in north Africa—25 Scimitar-horned oryx (Oryx dammah) were released in Chad three decades after they disappeared from the country. The oryx had been sent by the government of the United Arab Emirates as part of a plan to reintroduce them to Chad and Niger, where they were wiped out in the closing years of the last century. The initiative is a collaboration between Chad’s Ministry of Environment and Fisheries; the Sahara Conservation Fund (SCF), a non-profit working for Saharan wildlife; the Environment Agency-Abu Dhabi (EAD), a UAE government body; the Smithsonian Conservation Biology Institute, Washington; and, the Zoological Society of London. For now, the oryx will stay in pre-release pens in the Ouadi Rimé-Ouadi Achim Game Reserve. They would be released into the core area of the reserve in the rainy season. “We will release them once they are acclimatised to the local conditions, climate and food. Each animal will have a GPS collar and would be carefully monitored by satellite and ground teams to assess their movements and survival,” says John Newby, chief executive officer of SCF. The scimitar-horned oryx is one of the four distinct antelope species that constitute the genus Oryx. The East African Oryx and the Gemsbok are found in the south of the African continent, while the Arabian Oryx is found in the Arabian Peninsula. The scimitar-horned oryx is named so because its curving horns resemble a scimitar. The scimitar was what Europeans called any curved sword originating in the Islamic world. Its horns were also said to have inspired the myth of the Unicorn in Europe. Theorists reason that European travellers to Africa in the Middle Ages might have seen oryx with single horns, as the horns break easily and do not grow again. The oryx, in fact, features in the cultures of Egypt, Greece and Rome. It is depicted in frescoes and reliefs on tombs of the Pharaohs and noblemen in Ancient Egypt. It was bred in captivity to be either used in religious ceremonies or as a source of food. Ancient Greek historian Herodotus and Roman naturalist Pliny the Elder have described the animal in their works. It was primarily a hunting target for a number of Saharan tribes, including Nedmadi of Mali and Mauritania, Aza and Mahalbi of Niger, and Haddad of Chad and Sudan. The scimitar oryx, which had roamed across north Africa since antiquity, declined once Europeans began to colonise the Sahara in the 19th century. In the south, hunting by the Europeans for meat, hide and most importantly, horns, accelerated the decline. Habitat loss and competition with livestock added to the problem. Ultimately, the oryx was confined to Chad and Niger. Interestin gly, the Oryx was also being bred in captivity in several countries, including the US and the Gulf nations, as European colonists sold them to zoos across the globe. At that time, no one would have imagined that the captive animals would play a critical role in the reintroduction of the species in north Africa. The plight of the animal became worse when France conquered the area now known as Chad in 1900. Six decades of colonial French rule exacerbated the differences between Chadian populations, who are divided by geography, religion and race. There was a civil war between northern parts, dominated by Muslim Arab, Berber and Sahelian people, and the Black African south. In 1979, soldiers from Libya, Chad’s northern neighbour, entered the country to help a local leader win over his rivals. This is when the extinction of the oryx truly began. The Libyan soldiers ran amok across the Sahelo-Saharan landscape, along with their local allies, killing any animal that came their way. By the time the Libyans were sent home in 1987, the population of oryx was reduced to just 500. Chad’s troubles continued. In 1990, the country’s military chief, Idriss Deby, seized control of the country and became president. He continues to hold that position. During this time, Chad has seen continuous droughts and intermittent fighting. By 2000, the scimitar-horned oryx had been declared extinct in the wild in both Chad and Niger (where drought and over-hunting decimated them). This is when EAD and SCF began planning for a re-introduction. “We had been planning the reintroduction since 2008, when we started a series of stake-holder and technical workshops to assess options and interest,” says Newby. EAD has been nurturing what it calls the “world herd” of scimitar oryx. “One of our goals was to build a world herd of oryx in the UAE derived from zoological institutions and private collections throughout the US and Europe, as well as different collections within the UAE,” informs Justin Chuven of EAD. These animals would be mixed with those from EAD’s own oryx herds to ensure a genetically diverse and healthy population, resilient enough to survive in the wild, he adds. The only question that remains now is whether the reintroduced oryx can last in a country that is still a tad unstable? “The oryx will face many challenges but we strongly feel that the odds are in favour of a successful outcome. It is true we will have to work very hard to manage the risks but this is very much what modern conservation is all about,” says Newby. Oryx experts agree. “This is a very well-planned operation with long term aims. I am confident that it will succeed,” says David Mallon of the International Union of Conservation of Nature (IUCN). 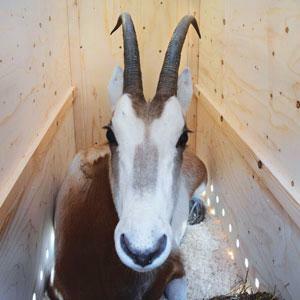 “If this project is successful, it will be first time that a free-ranging population of scimitar-horned oryx would have been reintroduced in their natural habitat in their indigenous range since their extinction in the wild. This will be a truly remarkable and historic event,” says Tania Gilbert, a UK-based conservation biologist.